The Byrds are well known for their many 60s hits, such as Mr. Tambourine Man, Turn! Turn! Turn!, All I Really Want to Do, Eight Miles High, and So You Want To Be a Rock ‘N Roll. But after David Crosby and Gene Clark left the band, in 1968 The Byrds recorded what some consider the first “mainstream” country-rock album (dramatically pre-dating the Eagles, thought by many to have started the genre which would later segue to become “Americana”). Though the band had leaned country at times, they had never jumped into the genre like they did under the influence of new infiltrator, Gram Parsons. Though the album did not sell well, it was well-received by critics, and in 2003 was ranked #117 on Rolling Stone magazine’s list of The 500 Greatest Albums of All Time. Unfortunately, Parsons only lasted six months with The Byrds, ultimately bidding them adieu to hang out with Keith Richards in London instead of touring with The Byrds in apartheid-ruled South Africa. One of the finest examples of country music from the album is the song Hickory Wind, written by Gram Parsons and Parson’s former band mate, Bob Buchanan, on a train ride the pair took from Florida to Los Angeles in early 1968. 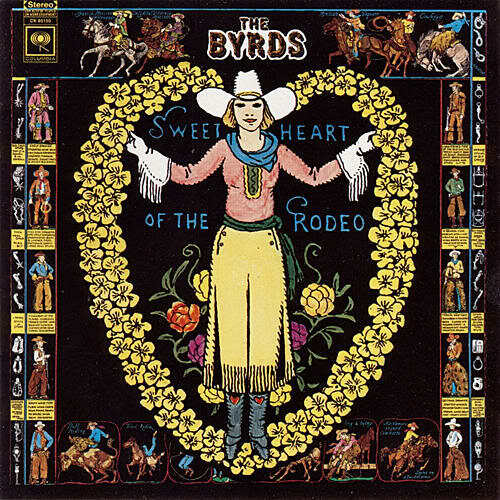 The Byrds ably backed Parsons on vocals, with the complete lineup consisting of John Hartford (fiddle), Lloyd Green, (pedal steel guitar), Roger McGuinn (banjo), Chris Hillman (bass), Kevin Kelley (drums), and Gram Parsons (piano). We loved this version the first time we heard it. It just doesn’t get any better. All the riches and pleasures, what else can life bring? We were recently asked to quickly name our Top 15 favorite albums of all-time. Amongst the other usual (and unusual) suspects, we immediately thought of The Kink Kronikles. We first bought this Kinks album soon after it was released in 1972 (dang, 38 years ago). In short, we played it to death and still love to spin it regularly. As has been written about more eloquently elsewhere, the primary Kinks songwriter, Ray Davies, has had phenomenally prolific periods during which he penned preternaturally perfect pop and rock songs. The Kink Kronikles chronicles one such period and substantiates that Davies is one of the great songwriters of all time. 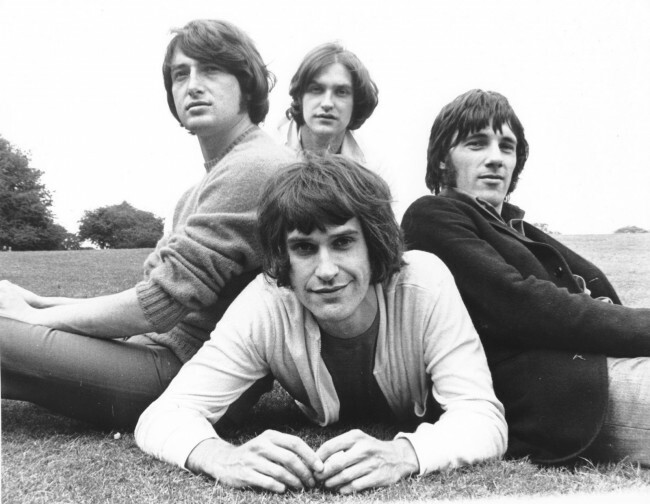 The first time we ever saw the Kinks live was in 1974 at UCSB’s Robertson Gym in support of their concept album, “Preservation: Act II.” We were bowled over by the band’s songs, theatricality and musicianship. We loved the band’s Act II show, but nothing could prepare us for the encore that night, consisting of their bigger hits such as Lola (it’s still remarkable that radio used to play songs like that), Waterloo Sunset, All Day and All of the Night and You Really Got Me. We still recall being blown away by Davies as a performer and songwriter. You certainly could not tell that Davies had suffered severe nervous breakdowns and survived a suicide attempt the prior year. All we knew, while singing/yelling along with the crowd to Lola, was that this gifted entertainer, his brother Dave, and the rest of the band brought unbridled joy to the attending crowd. 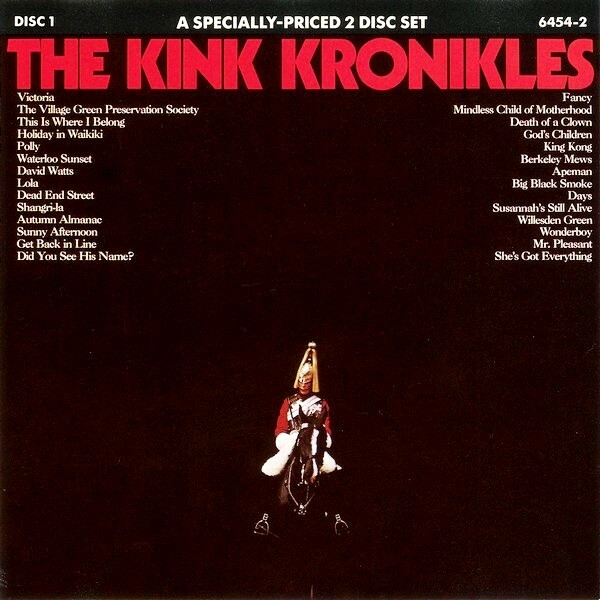 The Kink Kronicles was a USA-only compilation double-album (curated and compiled by great rock critic John Mendelsohn) of singles, B-sides, album tracks and previously unreleased tracks recorded between 1966 and 1970. While the album doesn’t include some of their biggest hits (e.g., You Really Got Me and All Day and All of the Night, on which Jimmy Page ghost-played some era-defining guitar) or some of our all-time favorite Kinks songs (e.g. the great pre-punk anthem, I’m Not Like Everybody Else, and the wistful Celluloid Heroes), it contains many of their best songs. The album is ultimately most successful in its inclusion of singles and rarities that complement each other well and present a complete picture of the band and the epoch. To our ears, The Kink Kronicles provides everything the Kinks meant at their best: invaluable vocals and highly individual music (eschewing all then-current trends), while combining raucousness and the beer-hall attitude that was always a large element of Kinks concerts. The complex bridges and key-changes are stunningly brilliant. And lyrically we hear the key elements of Ray Davies and the Kinks sensitivities: nostalgia, regular folks, village greens, and autumnal situations, leavened oft-times by the band’s off-center wit. Without further ado, check out below some of the best British pop songs ever written and committed to record. After beginning with our all-time favorite song of theirs, we move to the “complete course in rock melody” contained in the seven-song sequence acclaimed above by Rolling Stone. We love the story, musical variety and harmonies in this song. It’s amongst our all-time favorite songs. There are musical themes enough for four to five great songs in this five-minute song. Any Libertarians out there ought to enjoy the opening derision in this song, but hopefully your focus will be more on the remainder of the song, and the chorus in particular. We love the forlorn horn, the killer chorus and “Dead end! !” yells. Check out the keyboards of Nicky Hopkins (of the Rolling Stones’ band), the horns and the group vocals. What can one say about this song, but that we agree with Christgau’s assessment that it may be “the most beautiful song in the English language.” We love the song’s sentiment, the Beach Boys-harmonies, the descending bass lines, and spare guitar work. Perfect. Again the harmonies and horns, but with also with Ray’s clever lyrics and vocal phrasing. Here’s Ray and the band at their most ebullient, celebrating this wonderful life. What the heck, let’s throw in a Dave Davies gem. We love the celebration of the simple life, as interpreted by Ray Davies. Of course we must include their classic, proto-British rock anthem. And we have to include this rocker that hearkens back to an earlier period. “I’ve got a girl who’s oh so fine; she’s got everything.” Exactly. And we hear in this song (at 1:35ff) where Deep Purple stole that crunchy My Woman from Tokyo riff. Shameless. And finally, we end with the joyous Apeman, with its silliness mixed with the serious: “I don’t want to die in a nuclear war.” Indeed. There you have it. We encourage you to go forth and explore the Kinks’ fine back-catalog and those 1965-1972 studio albums. Caveat emptor, though: the years since 1972 have not been hugely favorable to the band or its songs (with notable exceptions), so tread carefully with respect to albums issued after 1972. (a) Purchaser shall have the right, at its cost and (if necessary) with Seller’s cooperation, to (i) order a commitment (the “Commitment”) for an Owner’s Title Insurance Policy from First American Title Insurance Company (the “Title Company”) showing title to the Property in Seller, dated after the Effective Date, setting forth any and all easements, liens, claims, restrictions, encumbrances or other exceptions to title (hereinafter “Exceptions”) together with all documents supporting such Exceptions, and (ii) select and engage a registered surveyor to perform an ALTA survey (“Survey”) of the Property in accordance with the requirements of the Title Company. After Purchaser’s receipt of the Survey, Purchaser will arrange to have Title Company update the title commitment (the “Final Commitment”) for the Property. If Purchaser, within thirty (30) business days after receipt of the Survey, or within ten (10) days after receipt of an updated Final Commitment showing new Exceptions, notifies Seller that it disapproves any Exception identified in the Final Commitment or any matter disclosed by the Survey (hereinafter collectively “Defects”), Seller shall use its commercially reasonable best efforts to, by the Closing Date, eliminate or remedy to Purchaser’s satisfaction such Defect(s). If Seller is unable to eliminate or remedy such Defect(s) within said period, Purchaser may either, at its election, terminate this Agreement with written notice given to the Seller (in which event neither party shall have further obligations hereunder and the Deposit will be remitted to Purchaser), or proceed with the purchase of the Property subject to such Defect(s). Notwithstanding anything to the contrary contained herein, the Seller shall cure or dispose of all such defects or objections to title which are fixed in amount and which can be cured by payment of a certain and ascertained sum of money only (such as mortgages, taxes, mechanics’ liens, etc. ), and if the Seller shall fail to cure or dispose of such defects or objections, the Purchaser shall have the right to deduct from the purchase price the amount which the Seller would be required to pay to cure or dispose of such defects or objections. (b) The Seller agrees to execute and deliver to the Title Company at Closing such documentation, if any, as the Title Company shall reasonably require to evidence that the execution and delivery of this Agreement and the consummation of the transactions contemplated hereby have been duly authorized. One of our historically-favored indie bands, The Decemberists, has announced the release of their next record, “The King is Dead,” on January 18th. We hope it’s a vast improvement over their last record, “The Hazards of Love,” which bored us to tears (save a couple of songs) and went straight to the dustbin (said with that faux-British accent adopted on song by American bandleader, Colin Meloy). The title of the new record has fueled speculation that it’s an allusion/homage to the great Smiths record, “The Queen is Dead.” We shall see, though it hasn’t hurt that Meloy has been covering Smiths songs live recently. Down By The Water is the first sampling of the imminent record, and if it is any indication, “The King is Dead” could be a resounding return to regality. The great Gillian Welch meshes perfectly on the song, as does R.E.M.’s Peter Buck on 12 string. Sounding very R.E.M-ish (circa “Document”), we love the added harmonica and overtones. 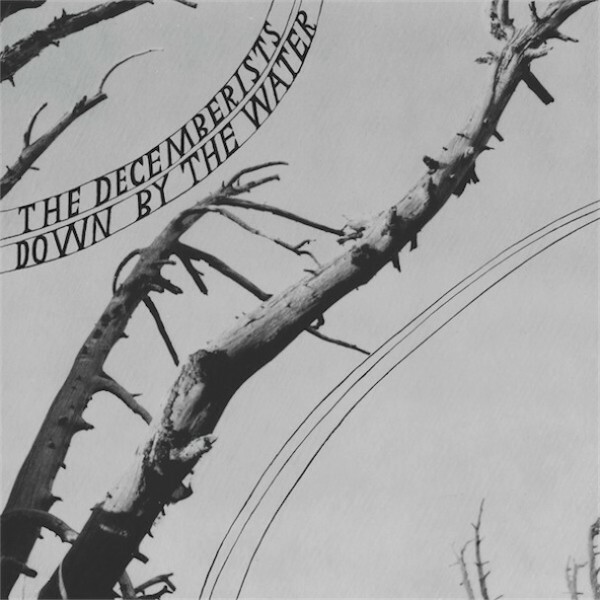 Check out Down by the Water below, along with We Both Go Down Together off “Picaresque” and Bridges & Balloons, a cover of the great Joanna Newsom’s song that was included in the 2005 Believer Magazine Covers Issue. 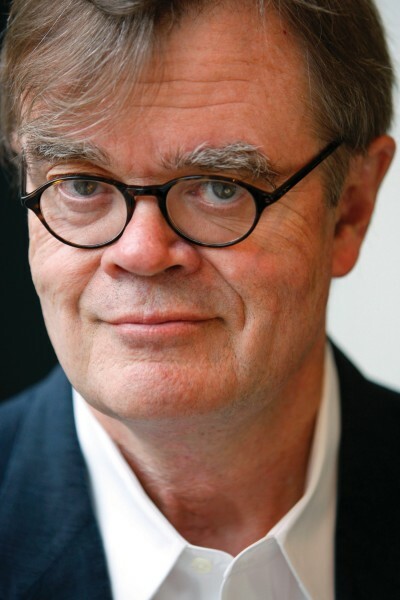 As we’ve written about before, Garrison Keillor is a national treasure. He is for us America’s Lifetime Entertainer Laureate. Changing everyone’s mind with a word. 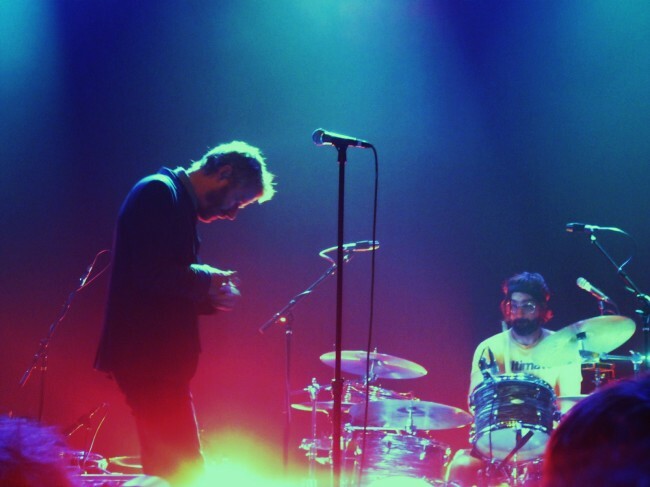 The National provide the perfect soundtrack to vote by; so listen in and get out!! Whether exhorting in Mr. November, or semaphoring fan-democracy in the “Alternative Take” below of Terrible Love, or lamenting a political campaign and vote (of sorts) wasted in Vanderlyle Cry Baby (one possible interpretation), the care and encouragement is all there. So get out and vote today. No excuses.